with prior coordination transportation to and from CID or DBQ Airports to the event site can be arranged. Food, beverages, and lodging are all onsite and are included in the ticket price. But beware that lodging is Open Bay or bring your own tent; air mattresses and/or cots and blankets can be provided if requested. Our annual Guild event furthers our collective understanding and interpretations of Master Meyer. We continue to focus on Kameradschaft, tradition building, and support of a generational approach to our beloved Art. a Fechtschul and a Feast. Full Participation Ticket is $160, includes all events, meals on Friday (dinner), Saturday (all), and Sunday (all), and Monday (breakfast). Price also includes loft lodging, or you can pitch a tent. Companion Ticket is $50, and covers all meals and lodging. The Madtown Fechtschule is a public display of skill and control with competitive Dussack and Longsword tournaments styled after the rules and restrictions of a 16th century event. 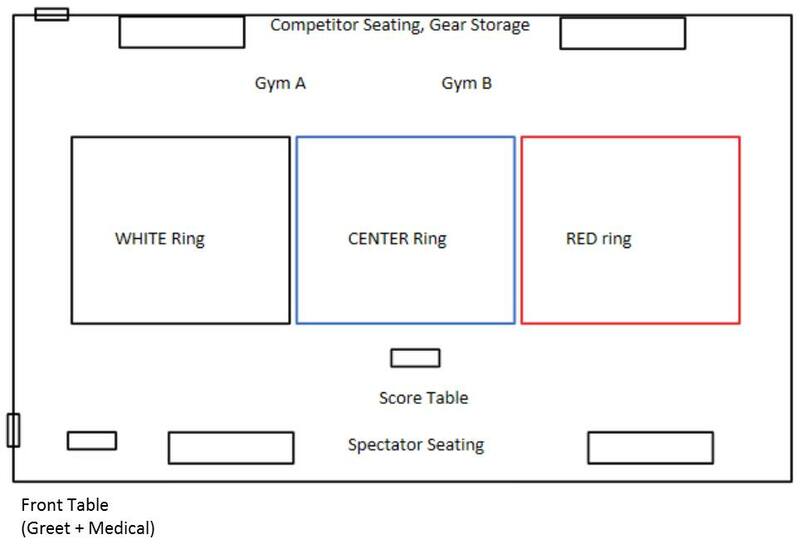 Competitors are randomly split into two pools. Each pool participates in their own fechtschule. Everyone will fence a King of the Hill, three passes to a match, five strikes per pass. The fencer who wins the most passes wins the match, which earns them one Victory Point (your gold coin prize). Fencers may also earn Artistry Points by exhibiting clean examples of Meyer’s dussack technique, awarded by the Pritschemneister. Winners are those fencers from each fechtschule with the highest Victory Point total, the highest Artistry Point total, and the Last Fencer Standing. These winners participate in the Winners’ Dusack fechtschule. All other remaining fencers from both initial pools are gathered into the Barber’s Pool. They will fence a King of the Hill fechtschule for honor and redemption. The redemption is the last man standing is entered into the Winners’ Dusack fechtschule. The Winners’ Pool fences King of the Hill fechtschule to determine the winners of the dusack portion of the event. For the longsword, all competitors fence King of the Hill in a single pool. Matches are three passes, five strikes per pass. Victory and Artistry Points are earned as in dusack. Note: Victory Points earned in dusack do not carry forward; Artistry Points earned in dusack do, and add to a fencer’s overall Artistry Point total. Winners are selected as in dusack (highest Victory Point total, highest Artistry Point total, Last Fencer standing). Losers of the first longsword fechtschule gather into a Barber’s Pool, and will participate in their own fechtschule, a King of the Hill as before in the dusack. The winners of the first longsword fechtschule and the Barber’s Pool fechtschule then fence in the Final Fechtschule. In the Final Fechtschule, the competitors fence King of the Hill, best of five passes. Winners of the Final Fechtschule are the overall winners of the Madtown Fechtschule. Head = Head protection must cover the entire face and front of the throat for drilling and slow sparring, and the entire head and front of the throat must be covered in competitive sparring. It must be sturdy enough to withstand impacts. There should be no gaps in coverage that would allow a thrust or strike to the face. Throat = A covering to protect the throat. Torso = Clothing to cover the body. Clothing should be puncture resistant, or three layers. Groin = An internal or external cup. Elbow = Hard elbow covering to protect the joints. Hands = Hands = Sturdy gloves or gauntlets must be used to protect the hands and wrists. Gloves must include protection on the sides and tips of the fingers sufficient to resist hard strikes from steel . An unsupplemented lacrosse glove is not sufficient.. Steel Gauntlets need additional interior padding of some sort, however a mechanic’s glove has minimal padding and when used inside a metal gauntlet would not be sufficient. Most HEMA-dedicated synthetic gloves or gauntlets, such as Sparring Gloves and Black Lance, are adequate. Finger breaks and hand injuries are the most common and organizers should be conscientious of this. Legs = Hard knee covering to protect the joints. Feet = Covering of some sort. 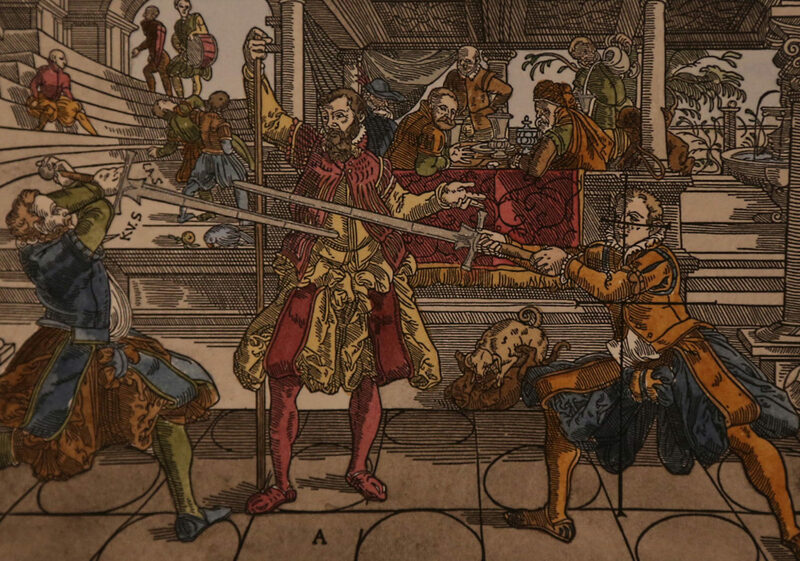 Learn the essential cutting, postures, and footwork of 16th century fencing master Joachim Meyer. This class introduces the basic fencing skills of one of the last inheritor’s of the Liechtenauer tradition of swordsmanship in an eight-part series of hour-long class sessions. Each class begins with a warm-up routine, followed by guided exercises and drills using historically accurate replica training swords. Be ready to sweat and have fun learning historical fencing. $100 for eight sessions pre-paid. Training equipment is included. $10 for guests attending the after event meal. 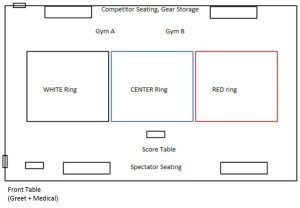 Competitors are split into two pools. Each pool fences King of the Hill, three passes to a match, five strikes per pass. The fencer who wins the most passes wins the match, which earns one Victory Point. Fencers may also earn Artistry Points by exhibiting clean examples of Meyer’s dusack technique. Winners are those fencers with the highest Victory Point total, the highest Artistry Point total, and the Last Fencer Standing. The winners from both initial pools go to the Winners’ Pool. All other fencers from both initial pools are gathered into the Barber’s Pool. The Winners’ Pool fences King of the Hill to determine the winners of the dusack tournament. The Barber’s Pool fences King of the Hill for honor and redemption. Winners are selected as in dusack (highest Victory Point total, highest Artistry Point total, Last Fencer standing). Losers of the first round gather for a Barber’s Pool, King of the Hill as before. The winners of the first longsword round and the Barber’s Pool then fence in the Finals. In the Final Fechtschule, the competitors fence King of the Hill, five passes, five strikes per pass. Winners of the Final are the overall winners of the Madtown Fechtschule. Sword meets sword in Part Two of this introductory HEMA longsword class. The Applied Concepts class builds upon the footwork and cutting material covered in Part One. Using contact drills, students will explore the fundamental concepts of distance and timing while learning how to parry and counter cut. Required Skills. The Applied Concepts course assumes basic understanding of Meyer’s terminology and a degree of confidence in performing simple cuts and footwork. Students must pass an evaluation of basic skills and knowledge in order to gain admission to the class. Prospective students may schedule a skills evaluation with Study Group Leader Eric Mains or Region III Chief Chris VanSlambrouck. The evaluation takes approximately 10-20 minutes, and a training sword is provided. Learn the essential cutting, postures, and footwork of 16th century fencing master Joachim Meyer. Fundamentals of Meyer’s Longsword introduces the basic fencing skills of one of the last inheritor’s of the Liechtenauer tradition of swordsmanship in an eight-part series of hour-long class sessions.